” Arvind Kejriwal’s Victory and the rise of the Common Class ” – India centric, February 2015. AAP ( Kejriwal ) celebrating their stunning victory in Delhi elections – Feb 10, 2015. Arvind Kejriwal’s Aam Aadmi Party ( AAP ) has scored a landslide victory in Delhi reducing the two major parties to napoo dispensation(s). BJP’s halcyon days have been cut short. Once the ‘ belle vue ‘ of the parties, Congress has been decimated to be ‘ hors de sujet ‘ . AAP’s valuation has risen by an astounding 240 %. From a tally of 28 out of 70 in Dec 2013 to a tally of 67 out of 70 now, AAP seems to have floated the biggest IPO ever in the political history of India in State elections. ” The first pancake you bake will be a failure ” is an age old Russian adage. Kejriwal’s first pancake in 2013 misfired, despite support from the Grand Old Party of India but now he has succeeded under his (AAP’s) own steam. 1. Several reasons have been adduced for the APP’s victory. Significantly missing from most reports so far is the key factor that I call ” the fresh political campaign perspective ” rooted in the new standards of campaign adopted by the AAP. Conditions of running a political campaign have been in a constant change since the announcement of the elections. Kejriwal’s ” Act I ” was to use the ‘digital platform’ in his campaign. It is plain, simple knowledge that digital information becomes old by the time the same news appears in print. It, nevertheless, gives a quick feedback with fresh ideas from the viewers that can well be used to formulate new strategies with a change in the course when needed. It also has the potential to shape the perspectives, views, opinions and expectations of the people. In today’s world people are willing to change their minds swiftly according to their enlightening experiences and needs of the situation. Information pouring from campaign platforms mold their opinions fast. Arvind Kejriwal’s “Act I” using the digital platform brought the attention of the youth to a common center. He had succeeded in his first move. 2. He complemented this move with a new standard of treating the people with dignity and projecting the image of serving the good. Kejriwal integrated his free Wi-Fi offer with integrity, forethought, discipline and confidence just as ‘android’ is getting integrated with (not just tablets and smartphones) cars, watches, thermostats and other gadgets. It is a ‘power grab’ play that Kejriwal won in a canter. If the temperature of the economy picks up in the months ahead, it will not be impossible and people will be in for a great blessing. 3. Our people are by and large a chatty bunch and digression from their critical needs is imperative. Kejriwal has been able to achieve this with a clear focus on a ‘ Total Positive Campaign ‘ without the rituals of rhetoric in play as opposed to the rhapsody of many others throughout the period. In doing so, while many others ‘talked it out’, he ‘thought it out’. 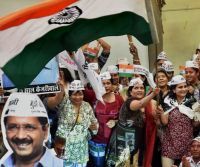 Staying humble and trusting his instincts – as borne out by the statement of his own teammate, Kumar Viswas, that Kejriwal’s internal focus may not be visible, but very strong – he proved that there is value in this in politics today. It is more of image making. People created a bonding in true spirit and practice this time with Kejriwal, the ” people person “. Leery with the pace of growth in the last year or so, people also responded with new hope and optimism. This is the crux of his campaign. In a nutshell, Kejriwal has possibly disrupted the status quo by relating to people, listening to others, understanding their problems & struggles, building awareness and support for decisions. He has seized the attention of the people. If the rise of common class is good for business (a key market segment for them in today’s context), the same seems to hold true in Politics too. Kejriwal has portrayed it clearly. Building an exceptional culture in his party in the days to come will only give him the lasting edge over his rivals in future.